Altior's triumph took trainer Nicky Henderson's tally of Festival wins to 56. The 1/4 favourite jumped and galloped strongly to pass the post six lengths ahead of second-placed Cloudy Dream. It was Henderson's sixth win in the Racing Post Arkle, and takes him ahead of Tom Dreaper to become the most successful trainer in the race's history. "That was the one that we had to win - it's good to get that over with," he said. "Just to have one [winner] on the first day takes an awful lot of pressure off us all, to be honest with you. "I feel sorry for Kim Bailey's horse [Charbel, who fell at the second-last fence] and hope he's ok - he was running a great race and we were upsides him at the time. We've met before - he led us over the last at Sandown and Altior did what he did then [Altior beat Charbel by six lengths in the Racing Post Henry VIII Novices' Chase], but Charbel was running a mighty race today. But Altior's done nothing wrong himself. "Altior is lovely, a hugely talented horse. He has been pretty perfect all year. Again his jumping there was accurate. He has got such scope and, at times, it was getting exuberant. You have to be careful around here doing that. He was great. "His life is still in front of him - it is only his first season over fences and hopefully Douvan will do his job [and win the Betway Queen Mother Champion Chase tomorrow] and then we can all meet up next year. There is so much to look forward to. "I don't know whether Altior will run again this season - there's no reason why he shouldn't, but maybe the Sandown race. He wouldn't go to Aintree - it's two and half miles and I don't think he needs that." 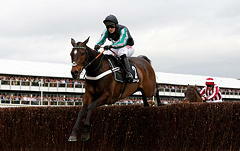 Altior has maintained his 100% success rate at The Festival, having won the Sky Bet Supreme Novices' Hurdle at the meeting last year. Trainer Malcolm Jefferson was delighted with 12/1 shot Cloudy Dream, who finished an excellent second. Settled in midfield early on in the two-mile contest by jockey Brian Hughes, Cloudy Dream travelled strongly into contention approaching the home turn and stuck on gamely in the closing stages to finish sixlengths behind Altior, who found plenty for pressure in the home straight to win. Ordinary World (25/1), trained by Henry de Bromhead, was a further nine lengths back in third. A delighted Jefferson suggested the ground was an important factor today, commenting: "He is a better horse in the spring with better ground. He won his first two novice chases and then he went a little bit lighter on us. Once January came, he has just turned and really thrived. "Altior's a real good two-miler, I think my lad will get two and a half miles quite easily, maybe even three miles one day. I didn't think we would win but I thought he would run a big race and he has done that." As for future plans, Jefferson suggested the Grade One Merseyrail Manifesto Novices' Chase over two miles and four furlongs at Aintree's Randox Health Grand National Festival will be next on the gelding's agenda, adding: "He will either go to Aintree or Ayr but Trevor [Hemmings, owner] will want to go to Aintree so that is where we'll go." Brian Hughes was similarly delighted with the seven-year-old son of Cloudings performance and said: "The winner is obviously a very good horse but our lad has stepped up massively and we thought he would on the better ground. "Malcolm had him in good form and thought he was in the form of his life coming into this race. "The winner's a very good horse and I know Charbel fell at the second last but I would have got by him anyway and my lad galloped to the line so I couldn't ask for any more. "He won his first two starts race over fences and then he ran twice on deep ground and I knew he wasn't 100% in himself the last time he ran at Doncaster so today I've got no complaints - he's run well." Ordinary World showed that his progressive form since graduating to fences, after two years hurdling, was no fluke when coming home third at 25/1. Having been placed second in his last two outings over fences at graded level, following a win in a beginners chase, it wasn't unexpected that the son of Milan should occupy a place in the enclosure on form but which one was the question. Trainer Henry de Bromhead was nonetheless delighted with his charge's third-place and said: "Any time you get in here (The Festival winner's enclosure) you have to be pleased. I am delighted with the race; he ran really well."